Money laundering is a global problem that's increasing in scale and complexity. 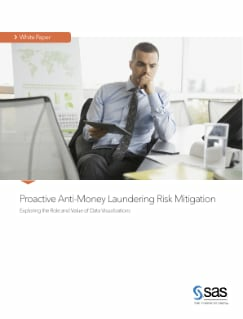 If your bank fails to swiftly detect and curb money-laundering activities, your organization – and its executives and board – risk negative publicity, reputation risk, and aggressive fines and penalties. This paper explores what's holding banks back from meeting regulatory compliance mandates and what’s needed to meet new demands for AML risk detection and reporting. For example, it discusses how innovative data visualization software complements traditional AML software (which only excels in detecting known AML scenarios) by identifying new patterns of money-laundering behavior as they emerge.